1. To allow or permit: to let him escape. 2. To allow to pass, go, or come: to let us through. 3. To grant the occupancy or use of (land, buildings, rooms, space, etc., or movable property) for rent or hire (sometimes followed by out). 4. To contract or assign for performance, usually under a contract: to let work to a carpenter. 5. To cause to; make: to let one know the truth. 1. See allow 1. suffer, grant. 3. lease, rent, sublet, hire. a. used as an auxiliary to express a request, proposal, or command, or to convey a warning or threat: let’s get on ; just let me catch you here again! Since we now know exactly what the word “let” means we can move on. We can let things happen, or we can fight to stop them. We can stand by and let things control themselves, or we can put in place actions or precautions to stop them. What would make us stop the process of some things? What would it take to make you become fighting mad to stop something? Would it have to be a threat to us? Would it have to be a threat to our children? Would it have to be a threat somewhere, involving our employments? I used the word “let” because it seems to be the simplest word to use, because it fits the meaning of exactly the thing I am trying to say. Can we as Christians, afford to let sin run loose upon the land? Can we keep letting sin and sinners dominate everything dear to us? Can we let satan and his demons keep on tramping upon the land? Are we going to keep letting the reign of demons dictate how we are supposed to live? Are we going to keep sitting around and let demons rule us, because Yeshua already told us that we are going to be wrestling not against the flesh and blood (humans) but the demonic spirits in humans? He already told us that we will be warring against principalities, powers, rulers of the darkness. Are we going to keep letting the demonic spiritual(meaning the spirit(s) in us that is evil) and evil spirits that rule us that sit in high places, keep making laws that constantly leave Yeshua and His Kingdom out. We can Help Yeshua our Messiah! What Can We Do NOW? PRAY, FAST, PRAY, FAST it is for real! Never Stop! There is power in numbers. There is power in the MASS prayers. Christians have a legal right to unite to form a body that can act as a unit, on His behalf. Lord Yeshua gave us the power to change this world; He gave us the keys to do His will upon the earth!! So Right Now…. What Are We Doing? “Let Sin Win….Right Now- I Don’t Think So! 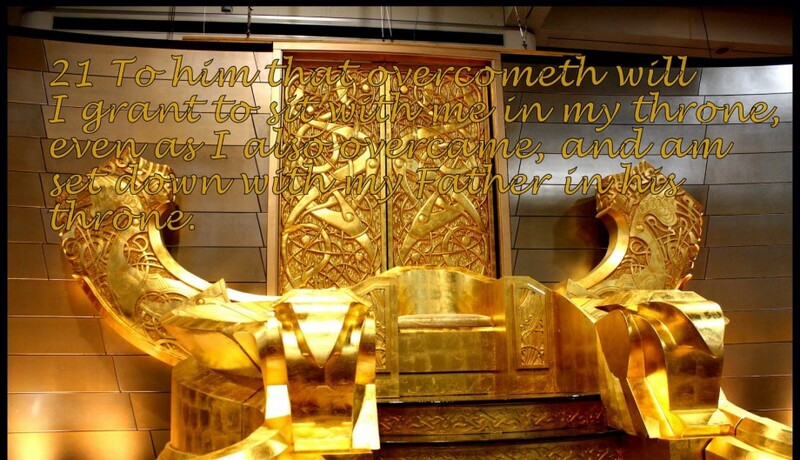 Yeshua the Messiah who sits upon the Throne still rules!!!!! Satan You are a liar, You Win NOTHING!!!! All of us Christian should have a thing going on with Yeshua, because we know he will work it out! But we have got to help! There is so much binding that we as the Church need to do. We also need to do some loosing upon the Earth. We need to bind the works of satan and loose the power of the Holy Spirit. King Yeshua gave it to us, to complete His will upon this earth. But from the looks of thing we are not using our power for the right things. Lord Yeshua is holding us responsible for everything we bind and loose upon the Earth. The church is the group of people within the church wall who have seriously been consecrated by Lord Yeshua, they are the ones endowed with this type of power) All who proclaim to be a Christian are not! There is Holy Power bestowed upon the consecrated Christian. There is Holy Power from Yeshua bestowed upon the set apart Christian. But not all this power. Why? Because they lack something; something of Christ, something that He gives all believers. A lot of name only Christians, lack the Holy Power to do anything about circumstances at hand, in any matter. But Lord Yeshua knows who the real Christian are. So therefore they receive the Holy Power. But don’t get me wrong some claim to have the power, they do, but it is not from Our Lord and Messiah Yeshua. Satan gives power too, his is called satanic power. Repent of sin in our lives. Seek His Face. Seek His ways. Pray in the Holy Spirit, if the Holy Spirit comes. But that’s when you have to pray until something happens. All Christians should find a way to get on one accord. Then Lord Yeshua can work for us and with us. To carry out His will in the earth. Lord Let us become as one with You, let us do as you have said in your Word for us to do!! The ‘key’ here is a key of power – it means “anointing oil” (taken from Strong’s 4668 – Myrna, anointing oil). As David is a type of Christ, this key represents the power God can give to man. It is not available for everybody – only for selected people. Notice that this ‘key’ is a burden – it lies upon the shoulder like a yoke. After the New Covenant everything changed. He passed the authority of the key to Peter which was then passed to all the Apostles and Disciples and then to all Christians. So the ‘Power of the Keys’ was invested in the Apostles, and through them to all Christians. This investiture has its roots in a scribe’s ordination where he was given a key as a symbol. The “experts in the law” were the scribes, and the “key to knowledge” was the key they received when ordained. Here Jesus is talking about how they have abused the knowledge they had by withholding what they knew and the anointing which goes with that authority. So this key, this key of power, this key which is like anointing oil, can unlock the storeroom and bring out treasures – by that we mean the Gifts of the Spirit. The “Key” that we get when we are saved is that same key – one which can unlock the storeroom of the Gifts of the Spirit. In passing this key on to us, Jesus has still retained the key to Hell. This is mentioned in Revelation 1:18 where He says “And I hold the keys of death and Hades” [NIV]. Binding a powerful witnessing tool: What keeps a person from accepting Jesus? The god of this world, which is Satan (working through his army of demons) has blinded their minds from the light of the gospel (2 Corinthians 4:4). Jesus taught us to bind the strong man, then we can plunder his house (Mark 3:27). If you have been trying to witness to somebody, and seem to be getting nowhere, try binding the spirits of darkness that are preventing that person from seeing the light in the gospel. You cannot bind a person’s will or force them to accept the gospel, but you can do something about the demons which are holding the person back. Once you take the demons out of the picture, you will be able to talk directly to that person without demons whispering in their ears and trying to combat what you are telling them. Lord and Messiah I need thee every hour! I pray Master Yeshua bind the works of satan against our lives. I pray Master Yeshua loose the Power of the Holy Spirit upon Your Children. Lord Yeshua grant us the Holy Power through the Holy Spirit to boldly do Your Will. To help usher in Your Holy Kingdom. Lord Yeshua we are waiting upon you. Lord Yeshua we worship you to the fullest. Prince of Peace, move upon the earth and your called out people to do the will of you Master. Lord the earth need to be cleansed, hearts need to turned towards you and filled with all of You. Amen Lord, in the Holy Name of Lord Yeshua Amen! sin and satan WILL NOT WIN ! Daily I have to listen to a calming music, this music helps me escape from the troubles in my life. It helps me stay focused on my on Lord and Redeemer, Lord Yeshua.